Now you can walk your dog in Harry Potter style all thanks to this Harry Potter Dog Collar. This dog collar is available in different sizes and also adjustable in size and you can choose between a breakaway or regular buckle. 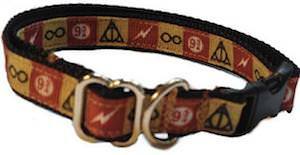 As you can see the Harry Potter collar is in Gryffindor red and yellow colors and it also shows fun details like the glasses, 9 3/4, lightning bold and the Deathly Hallow symbol . Now you can wear your Hogwarts robe and get ready to go for a walk with your dog and both will be in Harry Potter style. 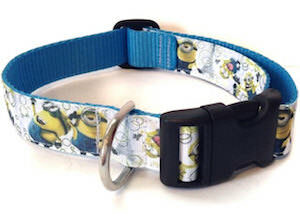 If you like Minions and you have a dog then you should check out this Minion Dog Collar. The Despicable Me collar is blue and has a white top with on it many Minions doing their own strange things. The Minion dog collar is adjustable in size and also comes in 3 different sizes so that your dog has a perfect fitting collar for when you go for a walk. The dog collar would look great on Kyle too but maybe Gru and the girls prefect something more scary looking for their dog. So now you dog can enjoy Minions too when you go for a walk. 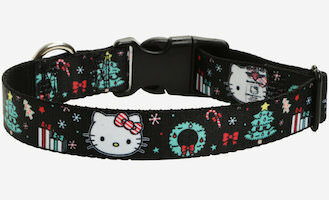 This Christmas you can walk you dog while it is wearing this Hello Kitty dog collar. The Hello Kitty dog collar is available in many sizes and is black and on the black you can see the head of Hello Kitty and many Christmas details like wreaths, presents, candy, and a Christmas tree. The dog collar is made from nylon and has a nice clasp for easy putting it on your pet and there is a metal loop for the dog leash. If you dog likes cats then they won’t mind this cute Hello Kitty collar and it does make even walking the dog so festive this holiday season. Now there is a Bob’s Burgers dog collar and your dog is going to love you for getting them this collar. The dog collar is available in 3 sizes and adjustable to make it fit perfect on your dog. The Bob’s Burgers dog collar has a seat belt style closing mechanism to make it easy to put on. On the dog collar, you can find the whole Belcher family in the Bob’s Burgers restaurant and yes the Bob’s Burgers logo in on there too. 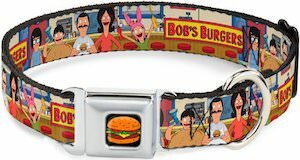 And on the buckle of the dog collar, you will find the image of one of Bob’s amazing burgers. Every super dog needs a cool looking, high quality and meaningful collar. This is a really fun collar to get your dog, featured is a black collar with multiple yellow Batman symbols all over it and a Batman symbol can be found on the buckle. The buckle is really cool it easily fastens just like a seatbelt and it will stay together through all the crazy dog running. The Batman dog collar is made to be very durable to last through the elements and can be found in a small size: 9 – 15 inches, as well as large: 15 – 26 inches. Dress your super puppy up in style with this Batman Dog Collar.